The retreat is on protected and has been running as a business for 8 years. You feel miles away from anywhere, only one neighbour in view and many rolling hills. We are 40 minutes from the beaches and from Malaga airport. The property is comprised of 2 fincas set in 18 acres (72.840 sq meter) of land. Can sleep easy up to 30 guests. The large finca is the hub of the retreat centre. 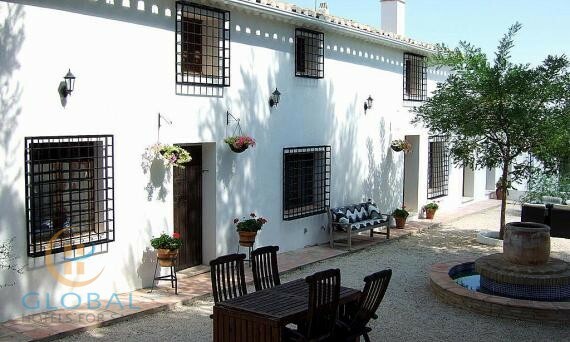 And the other finca is used as a private house for the owners. The large finca is rented out as a holiday rental home to mainly Yoga teachers and large groups of –pilates, thai chi, family events and special occasions. The layout is perfect for running a retreat centre, a rural B&B, or as as holiday rental property. The fincas are surrounded by over 100 olive trees and the owners do harvest the olives for their own delicious organic olive oil. The retreat centre: a 150yr old finca has been beautifully restored with antique tiles and keeping many of the original features. The courtyard on the eastern side has been renovated to create a huge daylight studio of 8x10m with glass curtains that open along one side. The versatility of this space allows it to be multifunctional, perfect for art retreats, winter dinners workshops and Bikram (hot) Yoga love it. There are 7 bedrooms and one meter thick walls. The ground floor has 2 traditional style bedrooms including another bedroom which is accessed from the outside seating area. The outside bedroom has a sink and a woodburner in. The mosaic tiled Haman style 3x3m steam room, which seats 16 people. The cave sauna for, complete with speakers. A large decked area with a shower to the side. The decking often used for yoga classes and has sails to shade in the hot months as well as 3m high poles where we attach a 3x4m screen to project films for a swimming cinema. Just past the pool (8x5) there is a 6mx3.5m bathroom block with3 tastefully designed units.-one full bathroom, one shower room and one toilet room. Two lovely wooden covered areas-one with railway sleeper designed seats another has a big bed underneath-perfect for siestas. On the far side of the pool area the path begins to the Yoga platform. The meandering walk brings you to a 9m x13m wooden, bamboo shaded Yoga platform. The design is completely original and is the largest wooden yoga shala in Europe. 2 luxury Tepees with electricity, comfortable beds and terra cotta tiled floors. and 2 gorgeous, Moroccan styled Me-pod. There is also two treatment rooms-approx 3.5mx5m, and an outdoor shower/changing area. (3x3m) the yoga platform is 20x12m and fits 30 people doing yoga, it is also shaded. Off the studio area there is a mud oven, and also small bathroom off the side. There are 2 main wells on the land as well as an old traditional well, and a hunters spring setback within a cave. There is also a half million litre reservoir situated next to the yoga platform. There is a possibility to get town water from the local village, some neighbours have. There is 3 phase electricity for both houses-all on one bill but it could be divided up if ever one was to sellone of the houses separately. This is a 200m build plot on 30,000m2 of land, with a beautiful garden terrace swimming pool above which is 4.5m x 10.5m, it also has a small kidi pool/beach area of the side and a wooden beach bar. The pool can be accessed from the house below or via a bridge from the master bedroom…,as well as walking down a pathway from the yoga platform.